We can help you make the kitchen of your dreams a reality. The kitchen is often referred to as the life-center of the home. We recognize the value added to day to day life with customized kitchens that work. 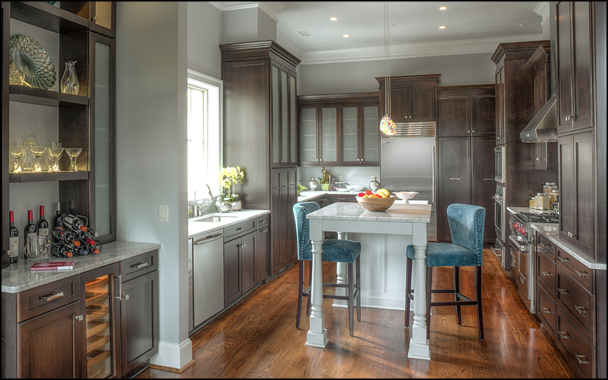 We specialize in smartly planned space, and cabinetry plays a very important role. Whether you are considering renovating your current kitchen, or preparing for new construction, we offer experienced space planning using smart and current (not trendy) solutions. As members of the NKBA (National Kitchen Bath Association) and other professional industry organizations, we make a point of attending continuing ed opportunities and trade show events. Bringing the ever changing information back to you, our next kitchen client. We also have accounts with high quality kitchen accessory providers, not available through retail channels. Their reps regularly attend our staff sales meetings and we study their product offerings. During our site visit and consultation phase of planning, our professional design team is most interested in learning what is important to you. Next we will sketch and provide 3-D renderings so you can see our ideas taking shape. If possible a visit to our showroom, located in the South End district of Charlotte, NC is encouraged to see all the door styles, wood species and accessories available for your consideration. All drawers are dove tail wood boxes using top of the line Blum soft close undermount slides. Semi custom to VERY custom cabinetry options available to accommodate your budget. Proudly our cabinetry is made to order in North Carolina, an area filled with generations of superior talented cabinetry craftsmen. We can’t think of a better legacy to embrace the heart of your home than to have it American made with pride and love. You can even meet the team if you wish! Every cabinetry project receives a written warranty. We have loved working with many, many clients on their new kitchen projects. You can see our work in the web site gallery and also additional pictures on our Award-winning Houzz page. Our design professionals look forward to helping you through the process of creating a beautiful and functioning kitchen you will LOVE to own. Let’s start today and schedule your consultation. “I truly can’t say enough wonderful things about our experience with IMPACT design Resources. We are absolutely thrilled with our new DREAM kitchen. They were able to take all my ideas & bring them to fruition. They maximized every inch of space in my small kitchen and offered solutions for storage that are not only functional, but aesthetically beautiful! The guys who installed the cabinets in my home were always on time, courteous & their attention to detail was unbelievable!